When Liam was born with a life-changing diagnosis, it felt like life as we knew it had come to an end. It didn't take long to realize that our story was just beginning. Our lives did change. Just not in the ways we expected. Instead, our family was enhanced by that extra chromosome! I always tell people that receiving a Down syndrome diagnosis is like joining an exclusive club that you would never ever want to join. Yet once you get there, you never ever want to leave. The Down syndrome community is amazing! Liam was just a few weeks old when we received his genetic test results. I typed up that post with tears in my eyes, and with all the courage I could muster, I finally hit publish. As the comments flooded in on my blog, facebook, twitter, and instagram, along with all the texts and emails, the tears fell even faster. These tears, however, were caused by the overwhelming love and support that was directed our way. We quickly settled into a rhythm as a family of six, and I was struck by how perfectly normal life still was. Liam began to fill our lives with love, joy, and smiles that could brighten the darkest days. I began to share what life was like with Down syndrome in the hopes that I could shatter some of those misconceptions and inspire just ONE person. It didn't take long for that smile to capture the hearts of those near and far. So I shared more. I shared his weight-gain struggles and I shared all his adventures. Mostly, I shared the fact that he's JUST a little boy like any other. The unique thing about Liam is that most people don't even realize he has Down syndrome unless they have experience with it. When I tell people he has it, it's usually met with shock, then followed by questions. I welcome questions! Asking questions is how people educate themselves, and that's a good thing! There was a time when I didn't share the fact that Liam has Down syndrome with people I ran into. Now I share it proudly. I have nothing to be ashamed of. My love for my boy is fierce and I am so proud of him! At the very beginning of our journey, I turned to other blogs, Facebook pages, and Instagram. I began following families who had children with Down syndrome. Seeing them live "typical" lives gave me so much hope. I fell in love with these kids from afar. I cheered at their accomplishments. I prayed during surgeries and health scares. I let out sighs of relief when those surgeries went well or when doctors gave them good news. I cried when their moms cried. 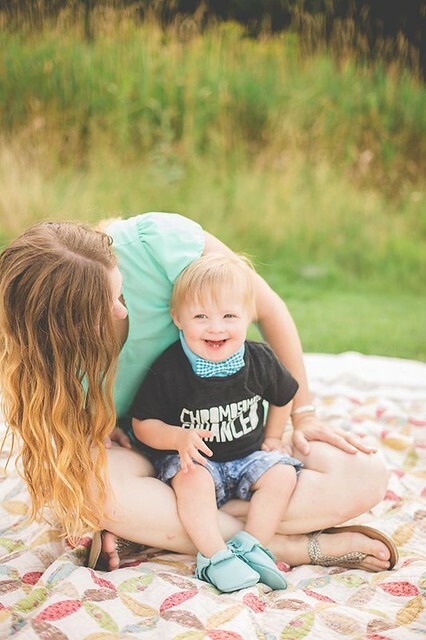 The thing about having a child with Down syndrome is that you don't just have your child. You have an entire community that you care SO much about. We all have different stories, but we have the same goal: we want the world to accept our little blessings and notice all those special things that captured our hearts. In order to do that, we share. We share our lives and we share often. All we want to do is make a difference and inspire change! All of my sharing IS making a difference. LIAM is making a difference! It's evident in the frequent emails and messages that I receive. THAT is why I share Liam and life with Down syndrome. THAT is why I'll continue to share for as long as I possibly can. I just want people to realize that Down syndrome is not as scary as it's made out to be! I want people to see that we are living a perfectly "normal" life and that we LOVE this life we are living. My story is just one of many. There are so many stories out there that deserve to be shared. Every single story is worth hearing. A few months ago, an idea began to form, and I began to reach out to others. Soon, I'll be launching the Downright Blessed: Life with Down Syndrome series on my blog! Every month, on the 21st, a different mom (or dad!) will share their story. I can't wait for you to read about these beautiful, inspiring kids and their amazing families! We truly are downright blessed! If you would like to be part of the Downright Blessed: Life with Down Syndrome series, please send an email to lexieloolilyboodylantoo@yahoo.com. Love this idea, you really are an inspiration! How amazing!! Liam really has touched my heart and from afar I cheer him on when you post his accomplishments! He makes me miss all my kids from when I participated with Special Olympics all through high school and college. I admire you and what you are doing. Thank you, Tracy! I can't wait to share all these stories! What a wonderful idea, Stefanie! Liam is so very blessed to have such an amazing mommy, and I know that you feel just as blessed to have his sweet little self in your lives. I mean, how could you not just ADORE his precious little face?! I can't wait to follow you on this journey! Fun! I'll send you an email later! Such a great idea! I can't wait to read about the stories and journeys of others. Thank you! I can't wait to share all these stories!